Yes, it is a word! Sometimes it can be rather funny to be a (Finnish) researcher. I have used word “ideating” and “ideation” in my presentations about creativity techniques in game design referring to the idea generation processes in general. This makes pretty funny faces in the audience from time to time and it is not rare to hear question: “Is it a real word?”. Even though we as researchers do have the priviledge to come up new and even awkward words suited to our purposes, it is not my invention or not even an adaptation from the Finnish word “ideointi”. This word DO exist outside my head as well. Serious references could be found in the creativity literature, for example in the article of Maria M. Clapham “The Development of Innovative Ideas Through Creativity Training” from the International Handbook on Innovation (2003, Elsevier), which is actually nice overview of the effects of different creativity training approaches. 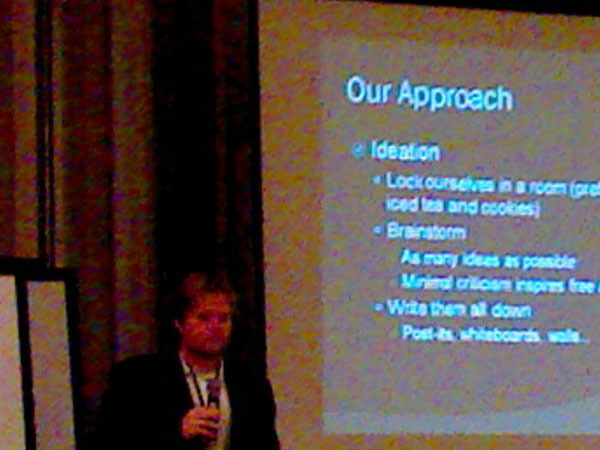 Clapham says: “A critical component of innovation is idea generation, or ideation“. More entertaining reference we found at the Future Play 2007 conference. One of the presentations was about prototyping and the presentators made some points on idea phase of game design on the way. There were three of us, Finnish researchers, taking photos of their slides when the word “Ideation” appeared as a title of one slide… Funny. It IS a word for others as well! For what comes to the quality of this presentation, I would not dare to say anything… But at lest we got entertained by one slide. It is a happy discipline, after all! 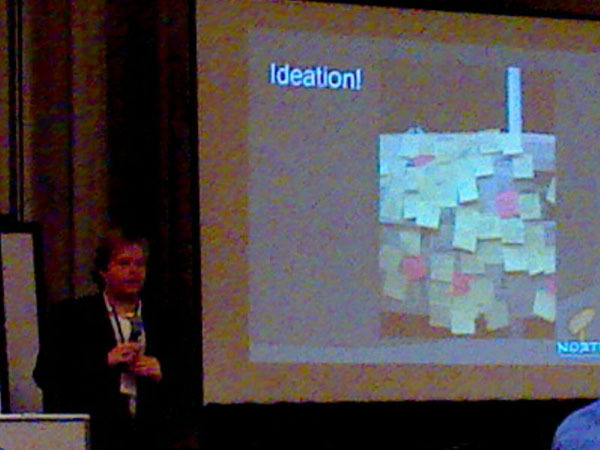 Ok, it seems that “ideation” is covered, but I am still lacking the coverage for the word “ideating”. For those who are still suspicious, check it for example here: http://www.thefreedictionary.com/ideating. We initiated our game idea generation study in October by pre-interviewing game designers and alike staff from our industry partner companies. Before the period of travelling between Tampere and Helsinki, interviewing people and presenting the package, I had to finish the final touches on the package. It was important to give the package a touch and feel of a real product to increase the appeal for use and to reduce the threshold for use, so I worked on a coherent visual layout with all the six techniques, instruction book, feedback cards and even the bag itself. The polishing phase took more time than I was expecting and the last piece, the instruction book, was actually delivered to press after staying up from 1pm to 1pm next day. Still a lot of typos and other mistakes were left in the book. One can do only so much. 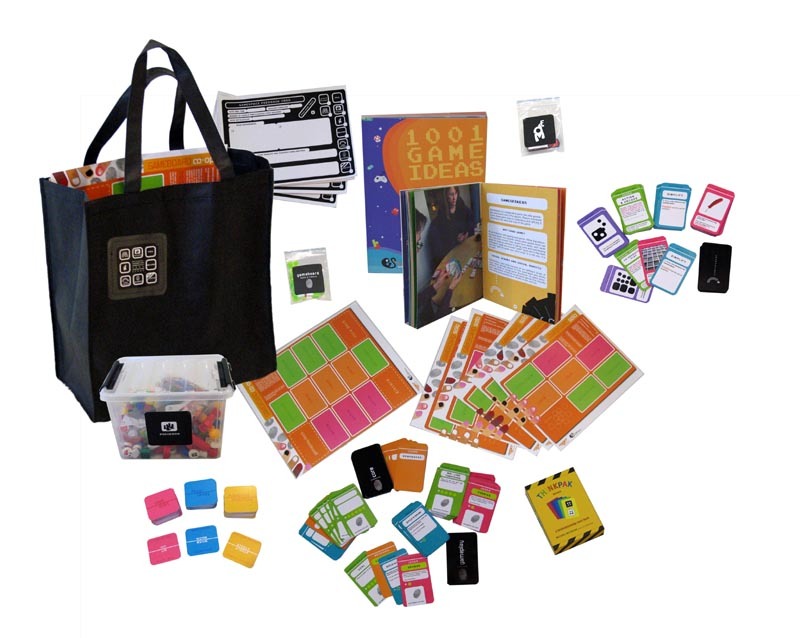 The Package includes 1001 Game Ideas book, GameSpace feedback cards, materials for five techniques (one technique, Mecano, is only with instructions): VNA, MorF, GameSeekers, GameBoard and PieceBox. Also one commercial technique (Thinkpak) was included into the package. I was supposed to give a speech at Mobile Games Seminar, L.A. this September about creativity techniques in game design (more specifically about game idea generation techniques that we have developed in GameSpace project) as I stated in the previous post. Fortunately my un-refundable plain tickets are not wasted, since I have planned all along to visit Seattle and Microsoft during the same trip. Now I just have more time to spend in the wonderful Seattle! During this first year of GameSpace project we have been, among other things, developing idea generation techniques for games to utilise at our research workshops. In these workshops we have discussed the limits and possibilities of casual, multiplayer and mobile games and expanding the game space with new game ideas produced with game specific idea generation techniques. From these workshops we have gathered the data of the use experiences and developed techniques based on the analysis of that data and ideas recorded. On the last workshop (Workshop III on mobile games) I was giving a presentation on some theoretical issues lying behind the idea generation techniques and underlying som points that rises from our analysis. I also introduced new techniques that our team had been working on. Some of the techniques are based on brainstorming, some of them were more game-alike or computer aided techniques. At the moment we are putting finishing touches to our techniques to conduct an extended study in real workplace situations. So far our findings have only concerned the first time uses of the techniques in a mixed company groups and workshop surroundings, which could be seen problematic. We are interested how they would be perceived as a normal part of the daily work in real game designing situations on a longer period of time. I am also working on a paper that would conclude some theoretical assumptions lying behind the creativity techniques to gain better understanding on the possible modification issues when it comes to the game specific ideation techniques. Comprehensive view on our findings on workshop uses of game specific idea generation techniques and the theoretical background I am also presenting at the Mobile Games Seminar in Los Angeles this September.